The Telematic Collective performed as part of the world premiere of the telematic opera Auksalaq on October 29 in sites that included Norway, Alaska, Virginia, Montreal and Indiana. 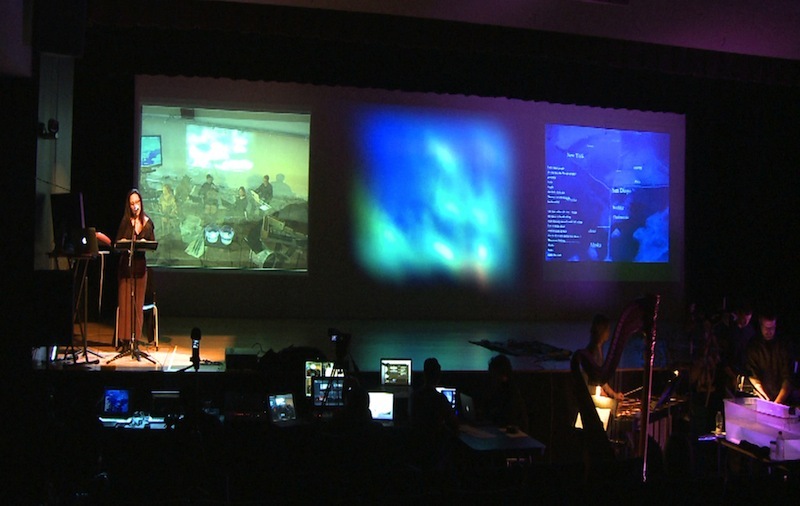 AuksalaqDrama was added to the premiere by the advent of Hurricane Sandy, which forced 2 of the scheduled 7 world-wide venues to cancel their participation in the multi-site, interactive opera about climate-change by composer Matthew Burtner and media artist Scott Deal. According to a news article on The Weather Channel, “Sandy strengthened before dawn and stayed on a predicted path toward Washington, Baltimore, Philadelphia and New York — putting it on a collision course with two other weather systems that would create a superstorm with the potential for havoc over 800 miles from the East Coast to the Great Lakes. About 2 to 3 feet of snow were even forecast for mountainous parts of West Virginia.” The Phillips Collection, in Washington DC and the Lu Magnus Gallery in New York were the venues forced to drop out. Auksalaq, the Inupiat word for “melting snow/ice”, provides an in-depth journey into the vast and remote, yet rapidly changing arctic regions of Alaska and Canada. Created by composer Matthew Burtner and producer/media artist Scott Deal, the work integrates artistic expression, scientific information, and social/political commentary into an interactive, multi-dimensional collection of narratives that provide a stirring and sobering commentary on the transformation of the Far North as a result of global climate change. Performance ensembles included Bit20 (Norway), UT Knox Ensemble (USA), McGill Percussion and Chamber Ensemble (Canada), EcoSono Ensemble (USA), and Telematic Collective (USA). An interactive audience-participation software called NOMADS enabled engagement with the performance in real-time across all the stages. Audience members were encouraged to attend the concert with their mobile devices in order to participate. In October 2011, Internet2, the nation’s most advanced networking consortium, presented the Internet2 Driving Exemplary Applications (IDEA) Award to Scott Deal and Matthew Burtner for their creation of Auksalaq, which was described as “the single best and most important realization of meaningful opera for today’s world”. For more information, please visit the Auksalaq website. You are currently reading Auksalaq World Premiere at Telematic Collective.